Reservations recommended: The atmosphere in the restaurant is cosy with padded chairs, semi-wood flooring and the bar occupying a central position. Vin’s serves up a mixed bag of Western food. NEIGHBOURHOOD restaurants are a tricky proposition. Usually, they’re away from the traffic mainstream, and thus, have to be reasonably good to survive. In the quiet neighbourhood of Taman Tun Dr Ismail, there are a couple of commercial centres, with shops, banks and restaurants, but there’s also a row of shoplots located like an island in the middle of the housing estate. Vin’s is the only restaurant on the block. It was a Saturday night, and when I walked in, there were almost no other guests, but almost all the tables had been reserved. A little later, by 8pm, the place was not only busy, it was jumping, and it was a mixed crowd: couples, families, groups of friends, even sole diners. Vin’s was proving to be a one-shop attraction in that quiet part of the neighbourhood. The décor was a bit pub-like, with muted lighting, upholstered chairs of the variety you find in country club libraries, semi-timbered dark flooring, a bare brick wall, and a large bar defining the layout of the restaurant. 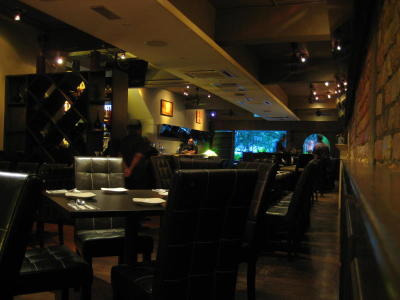 The overall mood reminded me of the style popular with Western dining restaurants in the 90s. The menu was a mixed bag of various Western styles, with a selection of soups, salads, tapas, pastas, burgers, (inventively titled “Between the breads”), pizzas, mains and desserts, and an extensive selection of alcoholic drinks. Pizzas and burgers, once representing informal dining, have somehow wriggled their way into the mainstream of Western style dining. Standing out were a couple of local dishes, a noodle and a rice dish. 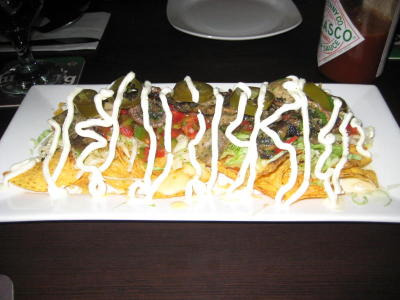 I was in a party of four, and we started with a shared Vin’s Chicken Nachos (RM28.90), which came quickly enough, served in a rectangular plate and looking quite distinctive because of a squiggly zigzag pattern of mayonnaise over the top. It tasted better than the presentation suggested, however, with crisp tortilla chips, a lively salsa and the slight bite of jalapeno, so it was a good starter. The waiter brought along the biggest bottle of Tabasco sauce I’ve ever seen, but it wasn’t needed. Of interest in the tapas section, though not sampled, was the Duck Crostini, comprising smoked duck breast, caramelised onions and red wine vinegar. Next time. The Caesar salad (RM16.90) was ordinary, both in presentation and taste, with a slightly thicker sauce than expected. The chicken nachos look snazzy with a zigzag pattern of mayonnaise. In quick order, the mains arrived, and my party had gone for the kill: Ribs (RM52), the Black Angus (RM58) and a Portuguese Grilled Chicken (RM34). The Ribs looked like a massive lump of charcoal on a thick rib bone atop a bed of roasted potatoes. A leafy salad and a thick brown sauce dressing were accompaniments. Appearance notwithstanding, the ribs were surprisingly tender to the cut. The meat was juicy and quite delicious, deeply infused with flavour. And no wonder, the menu claims that the chunk of beef had been braised for three and a half hours. The brown sauce was superfluous. 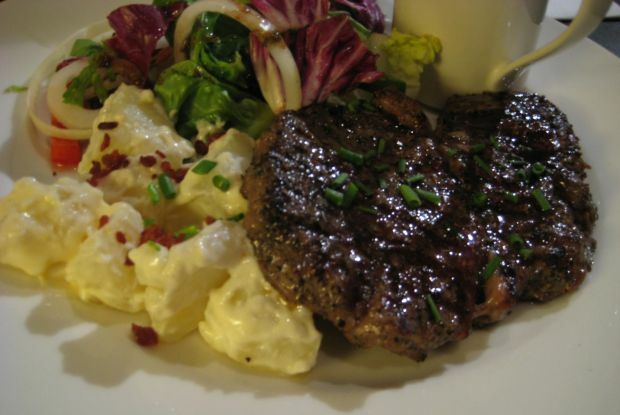 The Black Angus was a good portion of prime meat, served with a creamy potato salad and also a thick brown sauce. Not too thick, the meat was juicy when cut, medium rare as had been ordered. No faulting the quality of meat, or the grilling here. The Grilled Portuguese chicken was a slab of deboned thigh meat so beloved of Malaysians in general, and was perhaps the surprise of the evening. The meat was well seasoned and surprisingly flavourful. The accompanying thick brown sauce provided a tangy kick, tasting something like ranch dressing or BBQ dressing you get in bottles, although this sauce was freshly prepared, and featured habanero and peri-peri, according to the menu, so the tartness was to be expected.Accompaniments were well-grilled mushrooms, portions of potato and a leafy salad. We didn’t try any desserts, but overall, the main dishes had good, strong flavours with fresh ingredients, although the salads seemed cursory and could certainly do with some more attention from the kitchen. There were enough intriguing items on the menu to consider a second visit. The crowd at Vin’s amply demonstrates that there’s a good demand for unpretentious, hearty food in a relaxed neighbourhood atmosphere. The menu is what I’d call “Malaysian Western”, an evolution of what works for the Malaysian palate, and what most Malaysians consider “Western”, the way that Americans think a Chinese meal must always have chow mein or that infamous “egg-drop” soup. In that respect, Vin’s knows its market and certainly delivers. The restaurant is split into a smoking and non-smoking section, and although I understand the need to satisfy various personal preferences, I’ve always been dubious about this sort of arrangement, since air circulates freely. Reservations are recommended and specify non-smoking if you’re fussy like me. There’s also a small outdoor section sheltered from the road by plants, if you prefer the evening air to the air-conditioned interior. Service was friendly and quick, with the waiter pointing out house specialities, and there’s ample parking on the road outside.